Big data and Hadoop are very popular term and if we plan to have the same skill set, it means – nobody can’t stop us to fetch our career goals at all. Everybody from individuals to technology professionals are volunteering for Big Data course and projects, in order to earn the most valuable position and status. Yes, career with Hadoop means you can get your all the dreams come true and life will be wonderful. As Hadoop offers great job opportunities, thus, it is something must to go with. Talking about a Forbes report of 2015, it was mentioned that 90% of global organizations report medium to high levels of investment in big data analytics, and they say it the third call investments which is very important. It has also be founded that big data and analytics has a measurable impact on revenues, however, it has got great popularity among all. It is important to know that Hadoop skills are very much in demand, now, then and forever and this fact can’t be denied at all. That is why, there is a great demand of the IT professionals who have full knowledge about Hadoop and Big Data technologies. If you are liked with the Apache Hadoop, this is everything for you as it is enough to boost your career and gives you the various benefits. If you are very much serious to attain all your career goals and personal objectives, just be a part of Hadoop and get everything in front of you. Apart from this, if you would like to have the following advantages, Hadoop is the right choice for you.. 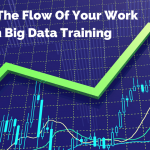 In order to boost career growth from good to great, Hadoop is something can’t be ignored. As it is very famous and demandable, however, it will give you a great chance to join the best companies to edge your career. Would you like to increase you pay package not for today, but for tomorrow? 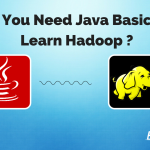 You must have great Hadoop skill and just see great improvement in the pay scale. All in all career in Hadoop is very rewarding and if you are serious for to uplift your career, you better kick start your career with Hadoop. Once you are done with the Hadoop course, now it is a time to pass few or more examinations and interviews in order to enter in the best companies. You should need to be prepared for simple to complex interview rounds and once you’re done, you can easily expect to have great experience in order to expand the career opportunities. Would you like to know the mostly-asked and very important interview questions? Here you will get all the major interview questions which will help you to get great success in the interview round taken by any small to big IT companies. 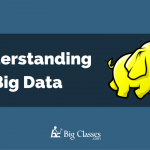 So, just check out Hadoop basic interview questions along with the answers for the freshers and experienced as follows..
What do you mean by Big Data and how it is important for businesses? it is a term that is used for the collection of large data sets, that makes it difficult to process using relational database management tools or any traditional applications. You should also mention the fact that it is complex to capture, preserve, search, share, transfer, research, and visualize Big data, that is why Big Data has emerged as an opportunity for most of the companies. In order to describe Big Data it will be a good idea to talk about the 5Vs in such questions, however, you never forget about- volume, velocity, value, veracity, and variety and explain all of them and their roles. In order to explain about its importance to hike the business revenues, you better mention an example of Walmart, which is the world’s largest retailer in 2014 in terms of revenue and was and already using big data analytics to increase its sales. 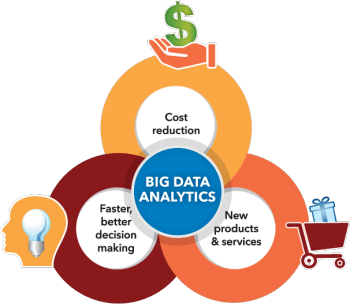 How Big Data can help it up and other companies as it supported a lot to go with predictive analytics as well as with the help of the same one can get the customized recommendations and launching new products based on customer preferences and needs. This way Walmart has expected growth was hiked from 10% to 15% as well as its online sales was $1 billion in incremental revenue. You shouldn’t forget mentioning about other top companies which are using Big Data, like- Facebook, Twitter, LinkedIn, JPMorgan Chase, Bank of America, and various others companies in order to build up great revenues. 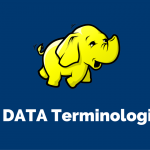 What is Hadoop and its components? It is another important and basic question which is possible to be asked by the interviewer. You should know everything about the same and can say that when Big Data has emerged as a problem, professionals developed Apache Hadoop, which is considered as a solution to it. 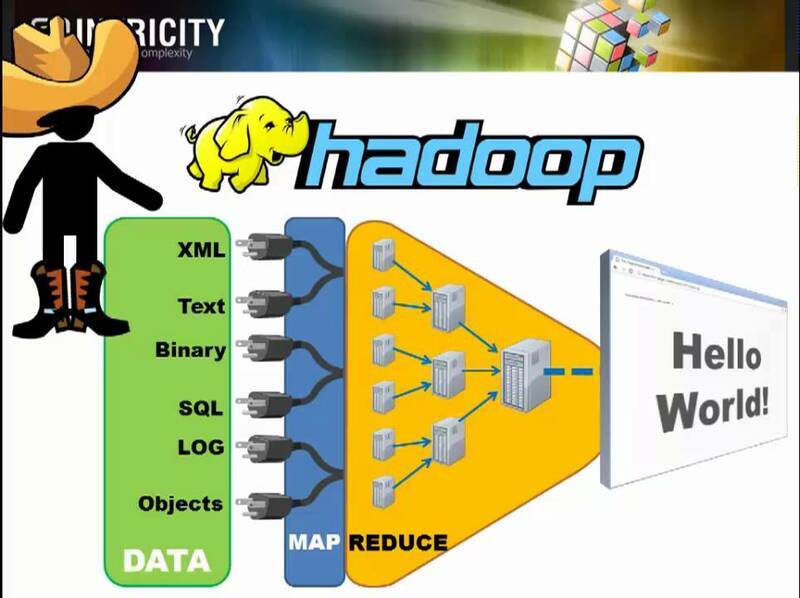 Apache Hadoop is a kind of framework which offers numerous tools, features and services to store and process Big Data. Not only processing, even it helps in analyzing Big Data and making business decisions the best, which can’t be possible with the use of any traditional systems. You shouldn’t forget to mention about its components, whether it asked or not. Here, they are..
Can you tell us the real-time industry where Hadoop can be used effectively? This is a practical question and you should need to be prepared for the same how and where Hadoop can be used and what exactly it does. You can start explaining about Hadoop or give a brief introduction about the same, like- it is an open-source software platform for scalable and distributed computing of large volumes of data and it is being used by almost every domain and sectors today. You shouldn’t forget about its major applications and it can be.. It is potentially used for managing traffic on streets. Yes, Hadoop is very powerful, which offers great help and support in order to streamline the traffic without any fail. This is the best in reducing the manpower as it is automated and can help anytime. If you are looking for quick and pro content management and archiving emails, Hadoop is the best choice ever. It will work exactly the users want it to perform and help in managing the emails. Those which are known for advertisements targeting platforms are using Hadoop so that they can capture and determine everything from transaction to click stream, video and social media data along with various others. Even, we can use Hadoop for managing content, posts, images and videos on social media platforms. Hadoop is offering great help and support to the businesses by analyzing customer data in real-time so that a business performance can be improved. Various or almost all the public sector domains, such as intelligence, defense sector, cyber security and scientific research and others are using Hadoop for quick help and support. Financial companies are very much using Hadoop so that all risk and issues can be reduced in advance as well as they can analyze any kind of fraud patterns, easily identify rogue traders, and lastly can improve customer satisfaction. This question can be asked by the interviewer and you should have the best answer to impress them up. You can answer the question as- Hadoop is a distributed file system, which is better than all when it comes to store and handle massive amount of data on a cloud machines as well as it is the best in handling data redundancy. You better mention a fact that it offers primary benefit and that is- the data is stored in several nodes and it is better to process it in distributed manner. Each node works in the best possible manner and process the data stored on it instead of spending time in moving it over the network. 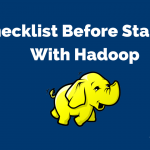 At last, you can mention that Hadoop also provides a scheme to build a Column Database with Hadoop HBase, so that runtime queries on rows can be possible. What do you mean by the JobTracker in Hadoop? As if you are using Hadoop, you should know what is jobtracker and how it is used in Hadoop. JobTracker is a term which is generally used in Hadoop for submitting and tracking MapReduce jobs. One can easily submit the client application jobs to the job tracker for proper storing and protection of the data. JobTracker is the best way in communicating to the Namemode so that data location can be determined. It is important to note that JobTracker locates TaskTracker nodes, which are near the data or with available slots. At last you can mention that the TaskTracker nodes are monitored by JobTracker. You should also be prepared for trouble shooting the problems and this question can be asked. You should know the answer in terms with- what will happen if you see that datanode fails or unable to work. The best answer can be- when it fails Jobtracker and namenode can easily detect the failure to get it corrected. Also, On the failed node all tasks are re-scheduled. Also, Namenode replicates the users data to another node. What are all modes Hadoop can be run in? Again, it is a very important question which can be asked. You better know the answer and that can be- Hadoop can run in three modes and you better name all of them.. It will be good that you explain all nodes and their uses. Starting up with Standalone Mode, you should explain about the same, which is a default mode of Hadoop and it is used in local file system for input and output operations. Not only this, the same mode is very famous when it comes – debugging, and it does not support the use of HDFS. Also, you better mention about the fact that there is no custom configuration required at all. Also, this is a mode which is much faster when compared to other modes. Pseudo-Distributed Mode is that mode where all daemons run on one node and thus, both Master and Slave node are the same. Last, but not least is- Fully Distributed Mode, which is known for the production phase of Hadoop for which Hadoop is known for. 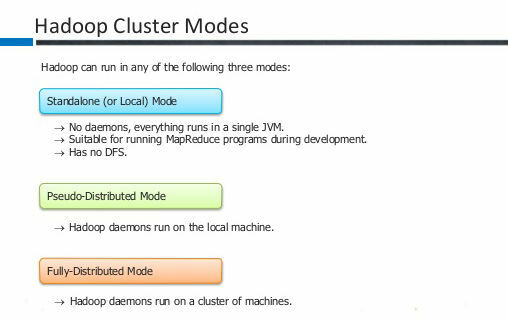 It is the mode, where data is used and distributed across several nodes on a Hadoop cluster. Don’t forget to mention that separate nodes are allotted as Master and Slave. Differentiate between Structured and Unstructured data. Next, you can be asked for the difference between structured and unstructured data, which you should need to know. Those data, which can be stored in traditional database systems using rows and columns, is called structured data. You can also give an example of online purchase transactions, which comes under the Structured Data. Those data which are stored only partially in traditional database systems are called Semi structured data. A perfect example for the same, is- data in XML records. 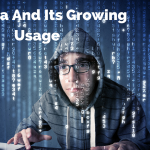 Coming to an unorganized and raw data, it is those data which cannot be categorized as semi structured or structured data at all, and that is called to as unstructured data. You can have various examples of the same, like- Facebook updates, Tweets on Twitter, Reviews on various sites, web logs, and various others. Aside this, you can be asked questions about the concept the Hadoop framework works, Hadoop streaming, input formats in Hadoop, fault tolerance and various others. Previous: Why Big Data Analytics is the best career move? 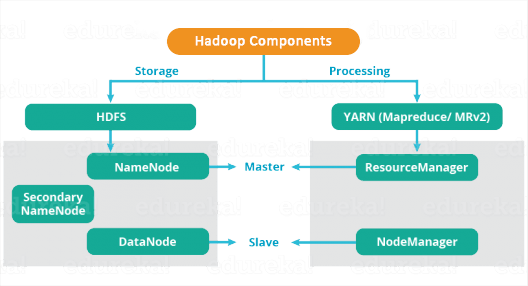 Next: Hadoop Architechture – What It Is And How It Is Important?